If I were to ask you to name as many NAS manufacturers as you could, I'll bet you still wouldn't come up with the product that this review covers. Making its debut in the SmallNetBuilder charts is the TerraMaster F2-NAS 2 Private Cloud Storage NAS. The F2-NAS 2 is a 2 bay Marvell-based BYOD device featuring lots of network services. It has full LAMP capabilities, and even the root password is provided for you. But priced at $179, it faces stiff competition from nine other less expensive 2-bay BYOD devices we have reviewed. And those nine devices come from manufacturers that you probably named such as Buffalo, D-Link, Thecus, QNAP, Synology, NETGEAR, ZyXEL and TRENDnet. 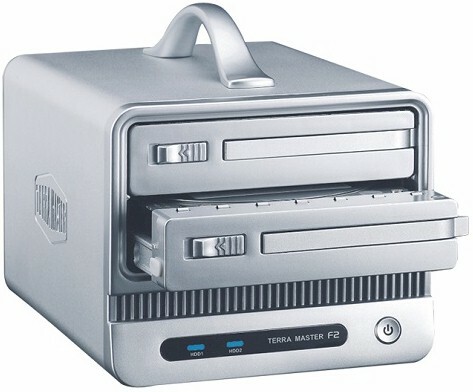 As shown in the product shot above, the F2-NAS 2 has a compact form factor. The case design is quite sturdy and is made from what appears to be an aluminum extrusion. The case has a vapor blast finish which is highly resistant to fingerprints. On each side panel the TerraMaster logo is engraved giving the case a nice high-end looking finish. The top mounted handle is a unique feature that I don't recall seeing on any other NAS. It's quite handy for getting the product out of the packaging and for moving it, but it does prevent stacking. The front panel accommodates two horizontally-mounted drives. When activated, the mechanical slide switch on the left side of each bay exposes a lever that enables easy drive removal. To install the drives, you have to first screw them into the included drive trays. It's not a big deal, but it does take a little longer to set up than NASes designed for trayless operation. The front panel is fairly simple. There's a power switch and two LED indicators. A grill below the drive bays facilitates cooling. The image below shows the front panel callouts. The rear panel of t he F2-NAS 2 has a somewhat unique design. The fan protrudes from the rear of the NAS, but is encased in the same vapor blast aluminum casing. The perspective below doesn't show that very well, but it does show the rear panel connections. There's a power jack, a single Gigabit Ethernet port with indicators for link/speed and network activity, a USB 2.0 port for external storage, e-SATA connector and a pin reset button. The F2-NAS 2 is powered by a Marvell 88F6282A1 running at 1.6 GHz. The Ethernet controller is a Marvell 88E1518 "Alaska" Gigabit Ethernet Transceiver that supports 4K, 8K and 9K jumbo frames. It features 512 MB of DDR3 RAM and 512 MB of flash. There's also a Marvell 88SM4140 Serial ATA II 1:4 port multiplier and an Atmel AT89LS52 8 bit microcontroller. For the purpose of comparison, I've compiled a component chart that includes three other two bay enclosures. From both component and a price standpoint, the ZyXEL NSA325 comes the closest. The NSA325 has a USB 3.0 port whereas the F2-NAS 2 has an e-SATA port. Below is a photo of the component side of the PCB.